The beauty of the Italian spring was upon us, heralded by a cloud of almond blossom upon hills and in the vineyards, and the white-blossomed trees seemed to re-echo the touch of distant snow on the Sabine mountains. I found a subject on the Pincio, a view of Rome, with almond trees in front and two figures gathering flowers on the sloping gardens, which I sent to the Dudley. 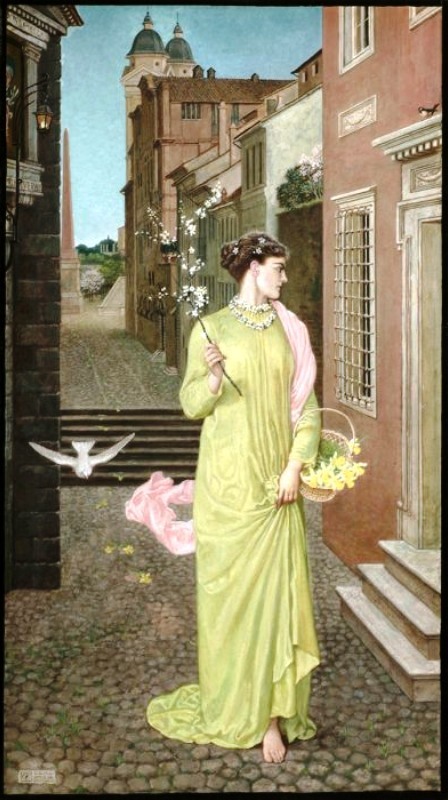 Also "A Herald of Spring"――a figure in a pale green robe and pin scarf coming down a Roma street in the early morning with a basket of daffodils on her arm.